This is a 0.5 oz, 1.6” by 1” by 0.4” oval of Petrovsky shungite from Karelia, Russia. 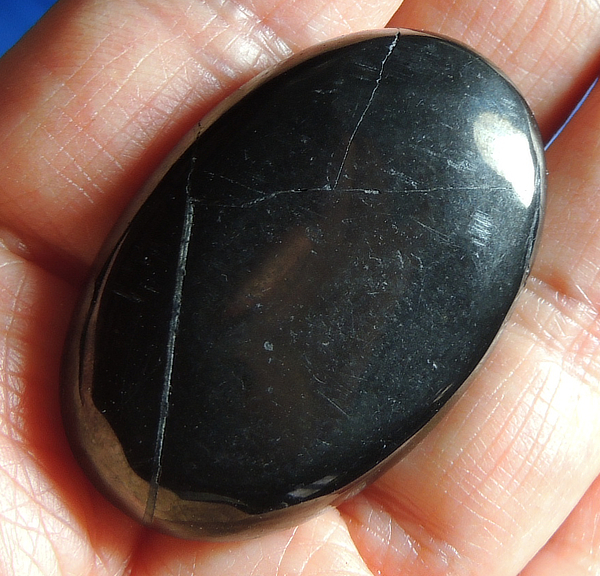 She has a wonderful polish that is not as intense as polished hematite, but black and with thin white veins. Shungite is a relatively new discovery … a natural fullerene or “buckyball”. These were discovered in the late 1980s and have been the subject of many experiments; prior to that time, no one had known that carbon could take on a rather spherical crystalline form as shungite in the natural state appears amorphous, meaning that there is no apparent crystalline structure. But it is made up of many teeny crystals … imagine a soccer ball and you’ll know the general crystalline shape when viewed under an electron microscope. For a discussion of the chemistry, check the Wikipedia. Now, the wondrous thing about Petrovsky shungite is that it contains 70-80% more of these special buckyballs than regular shungite and the result is electric! Truly, it is as fascinating energetically as it is chemically! Shungite has often been called the “Miracle Rock” and for good reason. It has a tremendous affinity for processing negativity and has been shown through testing to remove all harmful things from water for instance and many are sold for that purpose. In humans, experiments show that it slows the growth and advancement of both cancer and AIDS, reduces radioactivity in the environment, is an anti-inflammatory and antihistamine and absorbs electromagnetic radiation from power lines. Shungite is successfully being used in medicine, ecology, agriculture, water supply, metallurgy, energetics, chemical and construction industries. However on an etheric level, shungite pulls out that same negativity in your aura, your environment, in your life … and transmutes it. I am amazed – truly amazed – at what this amazing material does! I love the sphere form of it since that, for me, mimics the molecular structure. If anything is close to magical, this Sprit truly is and is a must-have for anyone!